Well, after the previous night's excitement I woke up with a strong appetite happy to end my fast. The plan for the day was a hike to lunch. A friend of John invited us to his house for lunch. 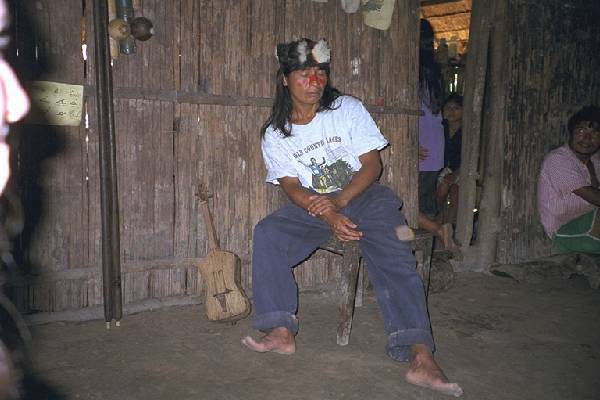 We would see our first Shuar home up close and personal. The trip would be done on foot and canoe. 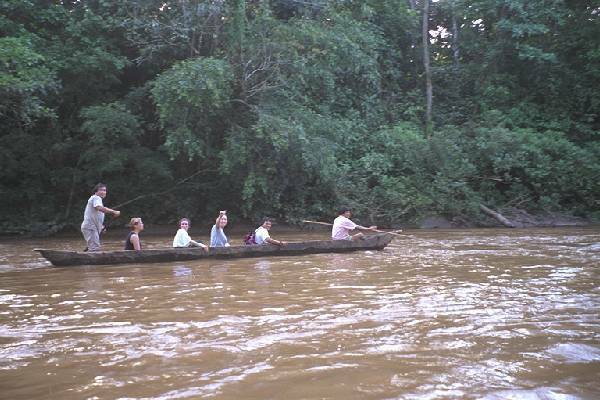 We had to traverse the river at 2 points to get to the home and our Shuar guides were good enough to assist us with the canoes to keep us dry. I took a walk on my own that morning, feeling the need to stretch and be one with the jungle around me. On my walk I met Don Thomas. He tried to communicate with me, but neither of us spoke the others language so we walked together without speaking, Don Thomas pointing every now and then, but with my eye sight in its usual deteriorated state, I rarely made out what he was pointing to though I did hear the sounds of the birds he pointed to. 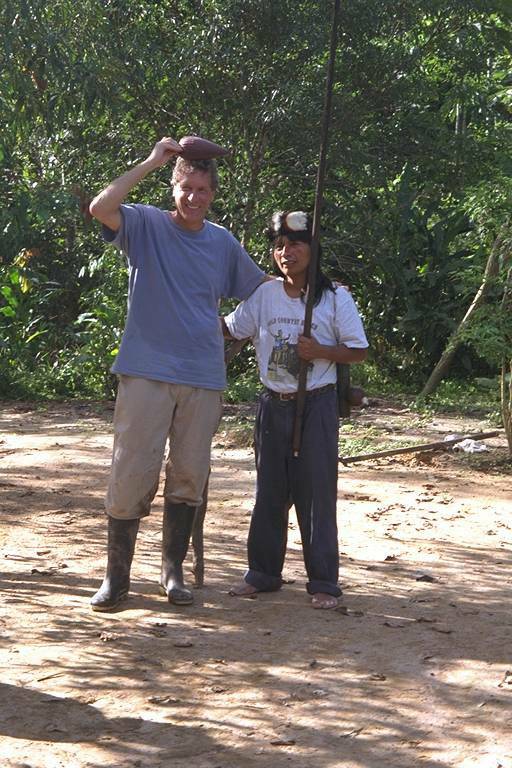 It was a moving experience walking together, I felt a bond with this Shaman of the Jungle. Finally our walk took us to the bridge and Don Thomas indicated that it was time to separate and symbolically he walked over the bridge and I returned back to the compound. 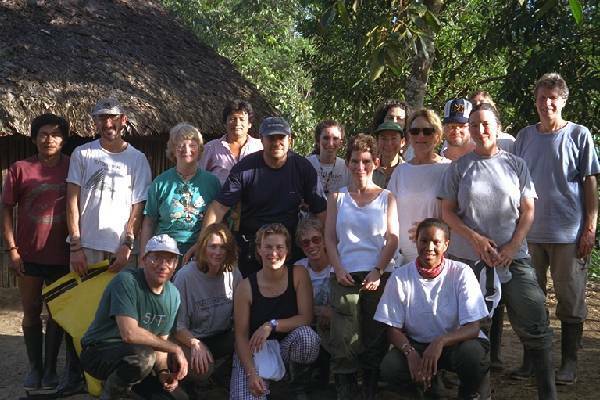 Before we went on our walk to our lunch appointment, each of us participating in the previous nights healing had a chance to speak to Don Thomas the Shuar Shaman we worked with. My time with Don Thomas held few surprises, using our interpreter he told me that I was in good shape, strong, and saw me shape shift during the healing. He saw us walking together, I introduced him to what I thought was an enemy of mine before realizing the person was a female and a friend of mine. The shape shifting he saw was me turning into a cloud floating in the sky. 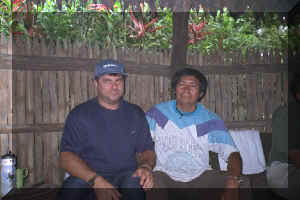 As all the Shaman I met with told me during this journey, Don Thomas saw me traveling, and traveling I have done. 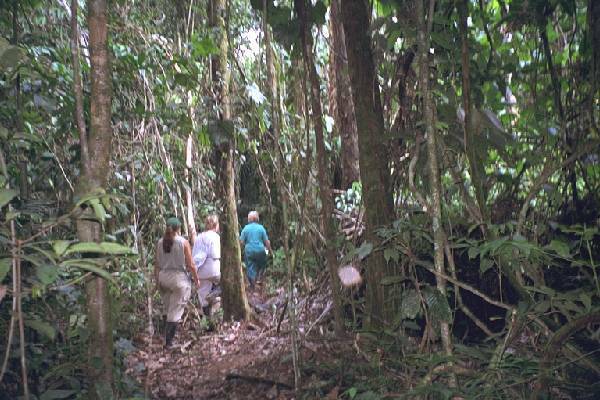 The walk was through a Shuar trail, something we had not yet experienced traveling to a from the Missionary or Watering holes. 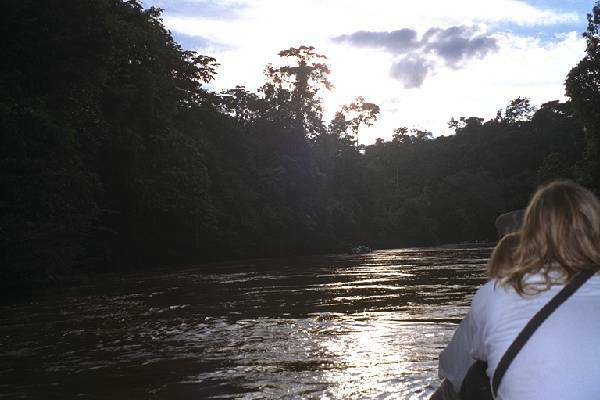 The jungle is a dangerous place and we were warned to keep our senses sharp and our awareness high. Watch every step, watch where you put your hands, make sure you have a good footing, in other words, "Walk Like A Shuar". This was a lesson one of our troop had problems with and another minor accident occurred to the same gentleman injured 2 days before. Along the way we saw many fantastic tree's and insects like a ladybug relaxing on a leaf. 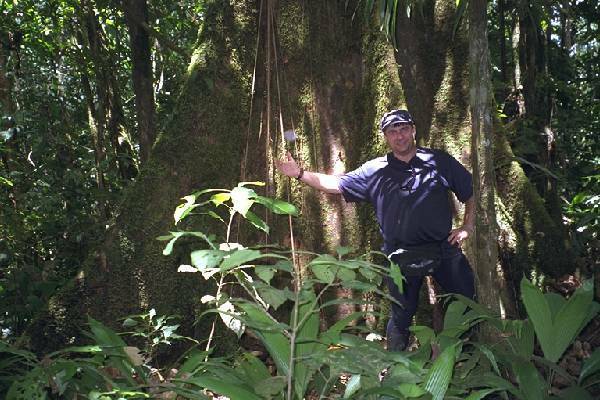 Now I am a big guy, but the width of the tree's made me look tiny, well maybe not tiny, but it was certainly impressive standing next to one of these giants. The walk was taking quite a while. Moving through the jungle, keeping ones senses sharp and climbing up and down inclines began to tire me. My body labored with each step challenging my ability to focus and keep sharp. My legs began to feel like the trunks of the tree's as they began to tire. 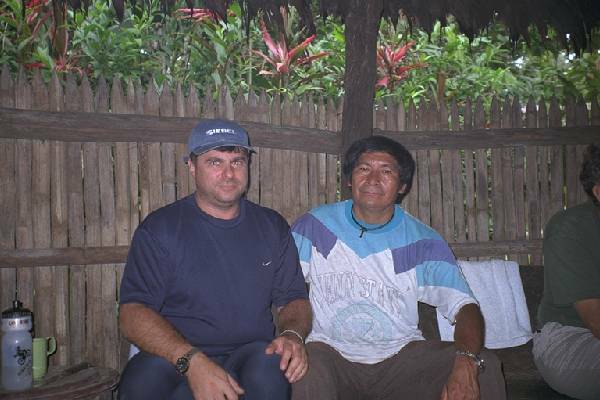 Finally when I thought I could no longer move, we arrived at the Shuar home. I was exhausted and just laid down on the ground in front of the house to catch my breath. We were about 24 people who showed up for lunch that day. Think of it, having a lunch group of two dozen, and not running water, no gas, no electricity to help cook. Not to mention no place to buy and cater such an affair, at least that is what my family used to do when placed in such a position, the women going out to hire help to serve. But here in the middle of the jungle we were welcome. 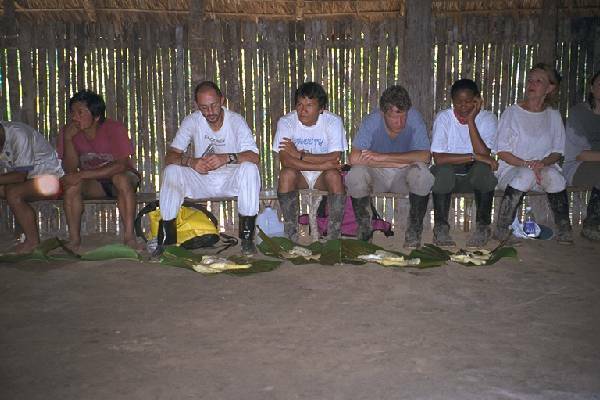 The meal started off as most Shuar meals do with Chicha. 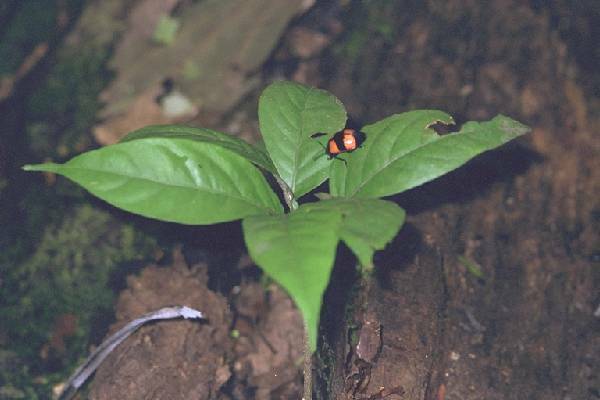 it was our first real experience with this drink representing the mainstay of the Shuar diet, a drink made by women only, as they chew on a local root, spitting it out into water and letting it sit for a few days. The water so full of microscopic life is not drinkable without the fermenting process taking place. Being told it is an insult to refuse the drink, I made sure to keep my head and have a taste from each of the three rounds made with the fermented concoction. I wondered how much chewing it took to make Chicha for 24 people, my jaw is tired just from thinking about it. Our host did not eat with us. Instead sitting with his back to the female section of the house, a section not made available to guests, he told stories and kept the crowd buzzing. After the meal he took out a violin his father made and began to play and sing for us. I was amazed and thrilled to watch and learn the art of being a gracious host. These are truly amazing people, warm, happy, full of life, full of mind altering substances as well, but who am I to judge. Next followed the post lunch activities, learning to use a blowgun. Yes you heard me right. 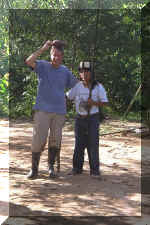 The Shuar use a blowgun about five feet in length as one of their primary hunting tools. Each one of our group had 3 chances to try the blowgun. Our objective was to hit a small gourd (seen on top of John's head) with a tiny dart. I was reluctant to try, my eye-sight kept coming to mind and the desire not to look like a fool drove me. But finally I gave in to the desire and took my turn at bat. Not seeing the gourd all that well I set my focus on the target. Having watched a few Bug's Bunny Cartoons in my time, I made sure not to inhale sharply with the weapon near my mouth. Taking a deep breath, placing the mouthpiece to my lips, I set my focus and blew a bull's eye. Our host looked at me a little strange probably having had more doubt's about my ability than I had. One final group picture and we were off to get in the canoes for the ride home. Hopping in to the dugout canoe, I became aware that after hitting an underwater rock while traversing the rapids, our canoe sprung a leak. Our guides were navigating through the water, bailing out the boat, and in a loud and non-embarrassed manner, passing gas that would challenge Mel Brooks famous Bean eating scene in Blazing Saddles. Not wanting to be useless, I took the old metal bailing plate with the hole in it and began to assist our crew. Well we made it down the river with only one near fatal event as one of the canoes began taking water on while trapped in the vortex of currents between 2 rivers that met up. Fortunately our brave troop did not wind up as anaconda vittles and managed to ride out the storm brining us back to our camp. With dinner upon us it was night 2 of the healing ceremony and instead of taking the Ayuausca, it was my time to watch over my buddy who took care of me the night before. We had a new Shaman with us that night, with minor differences including some drumming the ritual unfolded in much the same way as the previous night. This time I was without the influence of any mind altering substances. Equipped with 2 low light flashlights so as not to hurt the eyes of my body made sensitive by the Ayuasca, a cloth in case of the need for a cleanup, and forgotten socks to protect my feet from crawling creatures, I took my stance next to my buddy where I would stay all evening. My buddy much as I, was not significantly affected by the drug. Questioning his desire to participate in the healing with the Shaman, he finally decided to take his position in line for the healing. An uneventful night my buddy fell asleep and I soon joined him only to wake up and find him gone. Jumping out of bed I began to search for him to find him taking comfort with the appliances in the nearest bathroom. The excitement for the night concluded.